Property 1: WAWELOVE spacious 3 bedroom apt 1 min to Main Sqare! Property 2: Irena and Anatol Apartment - 5 min walk to Krakow’s Main Square! Sleeps 4! Property 11: Emeryk Apartment - quiet oasis in the city centre. Property 15: A spacious apartment located in the city center of Krakow! Property 16: Viva Las Vegas apartment in Stare Miasto with WiFi. Property 17: Wawrzynca 19, perfect location in trendy Kazimierz, Garage, AC, Lift etc. Property 21: Apartment near Main Railway Station, close to the Trade and Market Square. 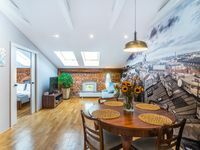 Property 24: Beautiful Apartment in the Heart of Krakow! Property 36: Exclusive Apartment in the centre of Cracow, 5 minutes from Main Station. Property 46: Apartment Wisła - just 400m from Market Square !